Not as easy as it might look to take this picture. I did NO editing this picture. It's the raw file (but save in jpeg for social media). I didn't used lightroom or photoshop. The colors are not saturated or I didn't lower the highlights etc. Maybe there is a little bit of dust (dust on the lens) like always, but I checked and couldn't really see it. That's also because I didn't used a little aperture ( I used f/6.3). If I used f/16 or even f/22, it would be way dusty and I would not have been able to just post the picture without editing it. To take the picture, I was on the jetty in front of the little village. It's maybe 20 meter from the buildings, so it's really close. You can't really have the whole picture with a 85mm or 55mm. 35mm is maybe ok but then I could not have all the water in the foreground. 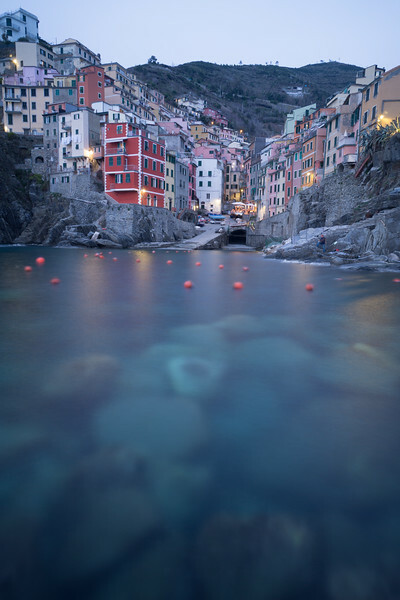 It would probably be great too, but I couldn't imagine to take a picture of Riomaggiore without the sea. I saw these big rocks under water, and I was lucky the mediterranean sea was quite calm and I was able to see pretty well the shape of these rocks. I tried pictures without filters, I tried an other composition but as soon as I put my tripod like a starfish just on the rock - which was the nearest to the water on that jetty with an incline of 40 degrees - I knew I had the right composition for my picture. I was also lucky that not so many people were walking in the village. There is just a fishermen on the middle ground who is of course "frozen" by the long exposure. But he isn't a problem for me when I look at the picture. There are also these giant red markers on the water, I could just photoshoped them, but I don't think there are really distracting from the main subject. I put my camera a 4 stops filter (Lee Filter) in front of my wide-angle lens and I shot with my remote control on (of course) manual mode : f/6.3 25s ISO 100. I tried other pictures a little bit later, but I wasn't possible to bring the light to the foreground. The shapes of the rocks and the blue color weren't there anymore. That's why for me, personally, it is a good picture. I took it at the right moment to be able to have those colors and a nice foreground. Ça n'a pas été si simple de prendre cette photo. Pour prendre la photo, j'ai grimpé sur la jetée juste en face du village. Il y a peut-être une vingtaine de mètres entre les bâtiments et la jetée. C'est vraiment très proche. Je ne pouvais pas utiliser mon 85mm. Même un 55mm aurait été juste. Avec un 35mm, j'aurais pu avoir le village mais ça aurait été impossible d'avoir autant d'eau sur la photo. Je ne pouvais pas prendre Riomaggiore sans y inclure en bonne partie la mer Méditerranée. J'ai vu ces gros rochers sous l'eau, et j'étais chanceux que la mer ne soit pas trop agitée pour pouvoir faire ressortir ces formes sous-marines. J'ai essayé des photos sans le filtre ainsi qu'une autre composition mais j'ai eu une bonne intuition en voyant un rocher de la jetée qui était proche de l'eau et incliné à environ 40 degrés. J'y ai installé le trépied en "étoile de mer", à raz du rocher, et je savais alors que j'avais trouvé ma composition. Il n'y avait pas trop de gens qui marchaient sur la photo. Juste des gens à table et un pécheur au second plan. Je pourrais l'enlever sur photoshop, mais je ne trouve pas qu'il soit gênant où il est, il fait parti du paysage. J'ai mis un filtre 4 stops réducteurs de Lee Filter sur mon objectif grand-angle afin de figer l'eau, de faire ressortir les rochers sous l'eau et d'amplifier les couleurs chaudes du village à la tombée de la nuit. Après cette photo, j'en ai essayé d'autres quelques instants plus tard, mais la couleur de l'eau n'était plus aussi belle, et on ne pouvait apercevoir les formes des rochers dans l'eau. C'est ce qui me fait dire que, pour moi, c'est une bonne photo. Je l'ai prise au bon moment pour mettre en valeur les éléments que je voulais volontairement mettre en avant.